Karlovy Vary is a town in Bohemia, in the west of Czechia. In English, it is sometimes called also Carlsbad (after the German name Karlsbad). It is a very famous spa resort, visited by many celebrities from all over the world. 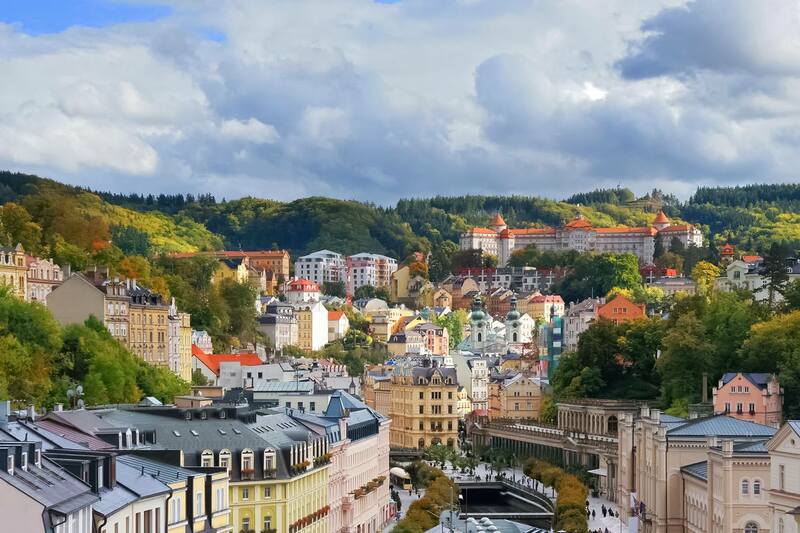 It is also known for the Karlovy Vary International Film Festival, held there every year. 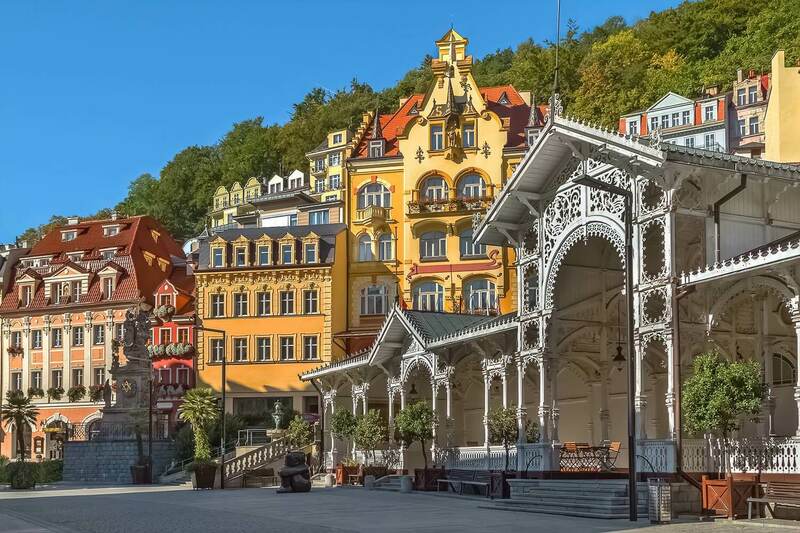 Karlovy Vary is one of the most popular tourist destinations in Czechia. 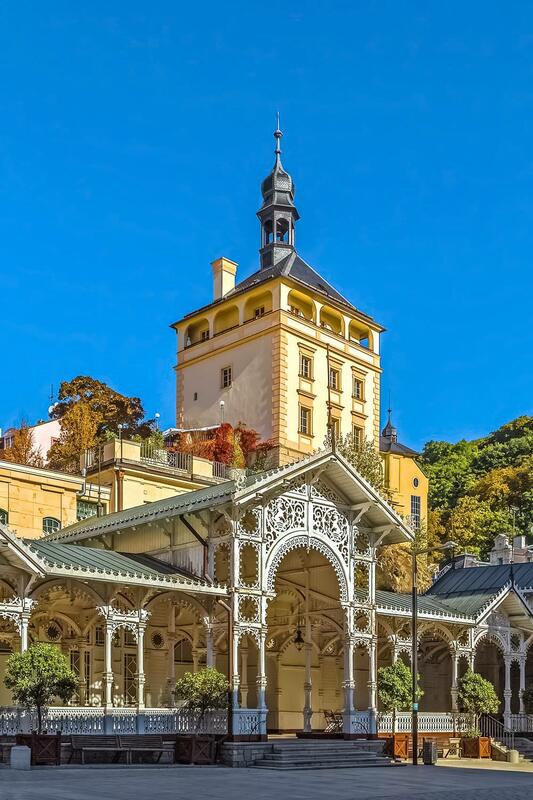 The history of Karlovy Vary dates back to the 14th century, when Charles IV founded a spa there, named Horké Lázně u Lokte, which means “hot spas at Loket“. Charles IV was the same king after whom Charles Bridge in Prague was named. 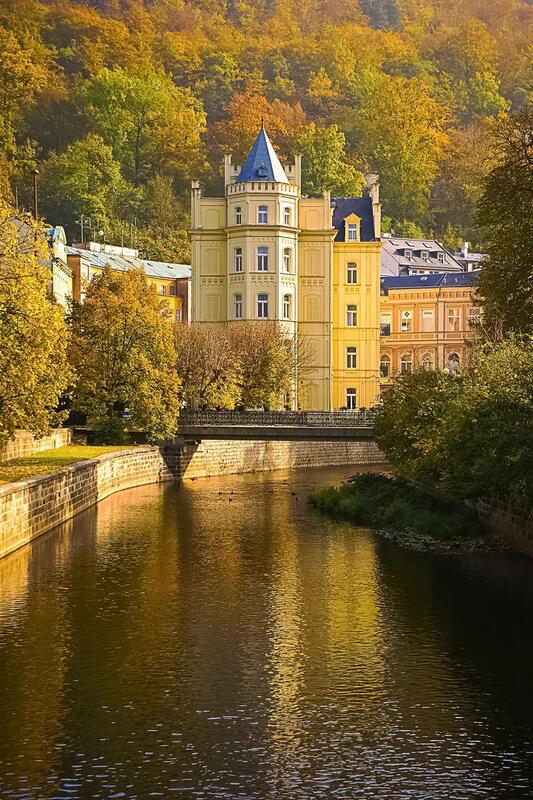 The settlement was renamed to Karlovy Vary later and was granted town privileges in 1370. Karl is the Czech version of the name “Charles” and vary is the plural of var meaning “boiling”. The name of the town may be therefore understood more or less as “Charles’s Hot Springs”. 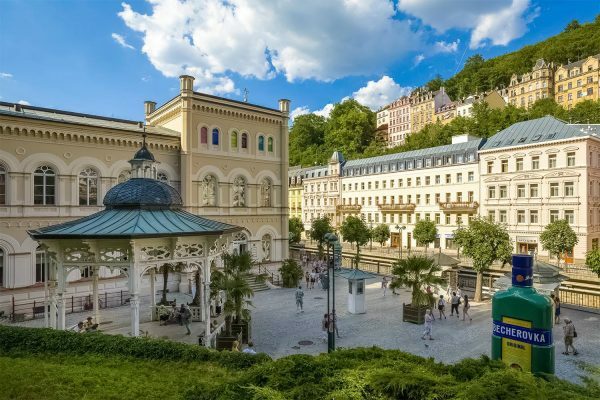 Karlovy Vary owes its development into one of Europe’s most popular spa towns to the publications of David Becher and Josef von Löschner in the late 18th and the 19th century. The number of visitors grew steadily and before the outbreak of World War I, around 70,000 people visited the spa town yearly. Among them were many aristocrats, politicians, artists and very affluent people. In 1918, after World War I, the town was incorporated into the independent Czechoslovak state. In 1929, Karlovy Vary Airport was opened. The majority of the town’s population in the interwar period was German-speaking. In 1938, the town was incorporated into Nazi Germany as part of the Sudetenland according the terms of the Munich Agreement. After World War II, most of the German population was expelled. 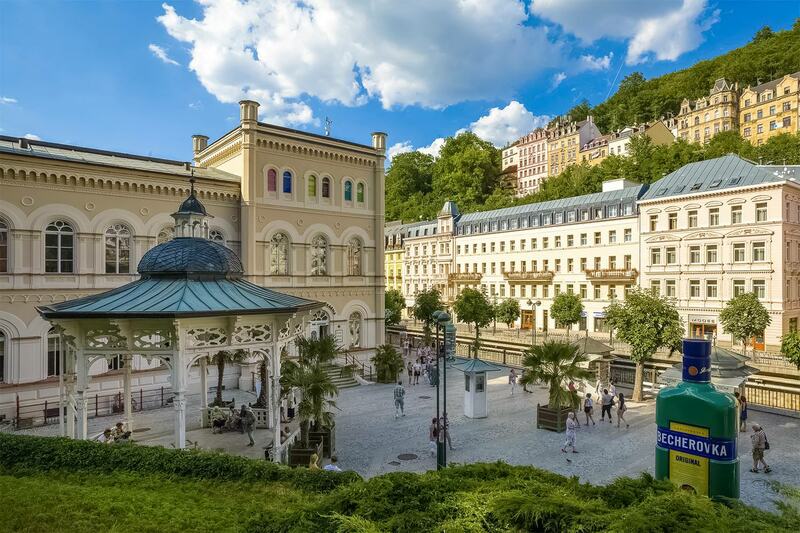 In 1946, the first edition of Karlovy Vary International Film Festival was organized in the town. Between 1948 and 1989 all spa establishments and resorts were nationalized and controlled by the communist state. Since the collapse of communism in 1989, the town has been gradually restored to its former glory. Its center is bustling with life and visitors can enjoy a very wide variety of spa treatments. A. Dalia is an inexpensive and very good guest house within walking distance of most attractions. Great value for money. Compare the prices and check the availability. Hotel Ontario is an excellent and affordable, 3-star hotel in the centre of the town, within walking distance of the Market Colonnade. Compare the prices and check availability. Grandhotel Pupp is a luxury, 5-star hotel. 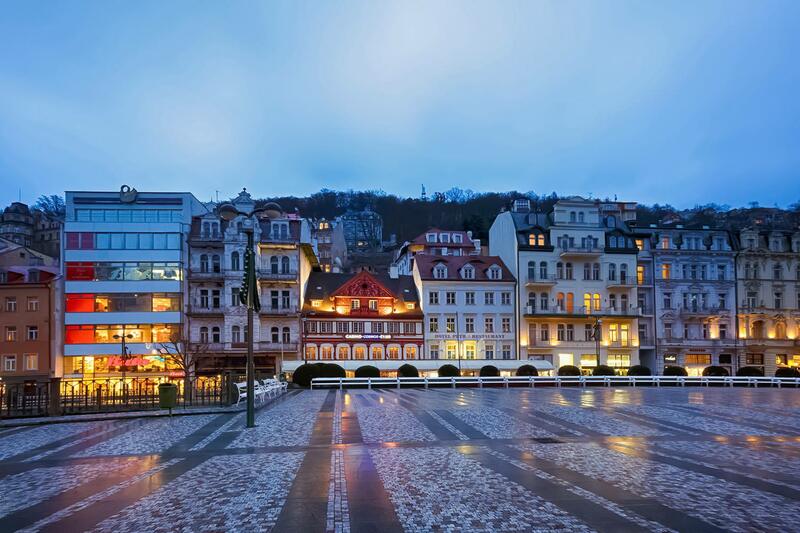 It's very famous for hosting the annual Karlovy Vary International Film Festival. It doesn't have to be very expensive, though. Compare the prices and check availability. Many visitors come to the town to enjoy wellness treatments or to attend the famous film festival, but fans of regular sightseeing shouldn’t be disappointed, either. The town has quite a few remarkable landmarks and sights. The Market Colonnade (Tržní kolonáda) is a white, wooden structure in the center of the town on the left bank of the Teplá river. It was created by the Austrian architects Ferdinand Fellner and Hermann Helmer in the Swiss chalet style and opened to the public in 1883. The Mill Colonnade(Mlýnská kolonáda) is the largest of all colonnades in the town. It is located in the spa center on Mlýnské Nábřeží Street. 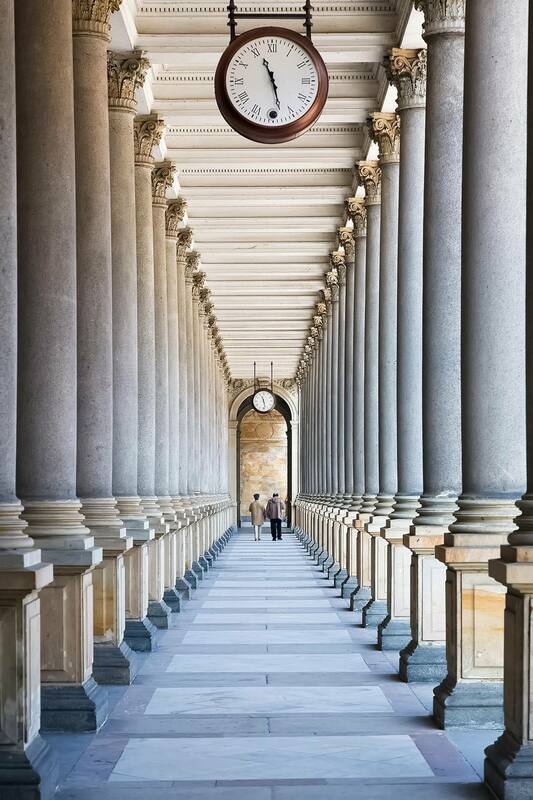 This colonnade is the work of the famous Czech architect Josef Zítek, who built it in the Neoclassical style. It was opened in 1881. The Mill Colonnade houses the seeps of five mineral springs. The Castle Colonnade (Zámecká kolonáda) is located near Zámecký Vrch Street. It was designed by the Austrian architect Friedrich Ohmann in the Art Nouveau style and opened in 1912. Nowadays, it is only partially accessible to the general public, because in the early 21st century, the Castle Spa was established there and only guests may stay there. The arbour with the Upper Castle Spring (Horní zámecký pramen) is still open to the public. The Park Colonnade (Sadová kolonáda) is located in Dvořák’s Park (Dvořákovy sady), next to Zahradní Street. 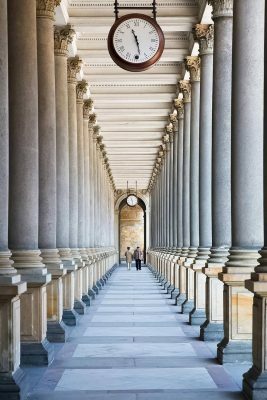 This is another colonnade designed by Ferdinand Fellner and Hermann Helmer. It was opened in 1881 and it houses the seep of Snake Spring (Hadí pramen). The Hot Spring Colonnade (Vřídelní kolonáda) is located in the spa center, next to Divadelní Square (Divadelní náměstí). It houses the most spectacular of the town’s geysers: Hot Spring (Pramen Vřídlo). Its water has a temperature of 72 °C ( 161.6 °F) and the jet reaches a height of approx. 12 m (39 ft). Around 2,000 liters (528 gallons) of mineral water are gushed every minute. 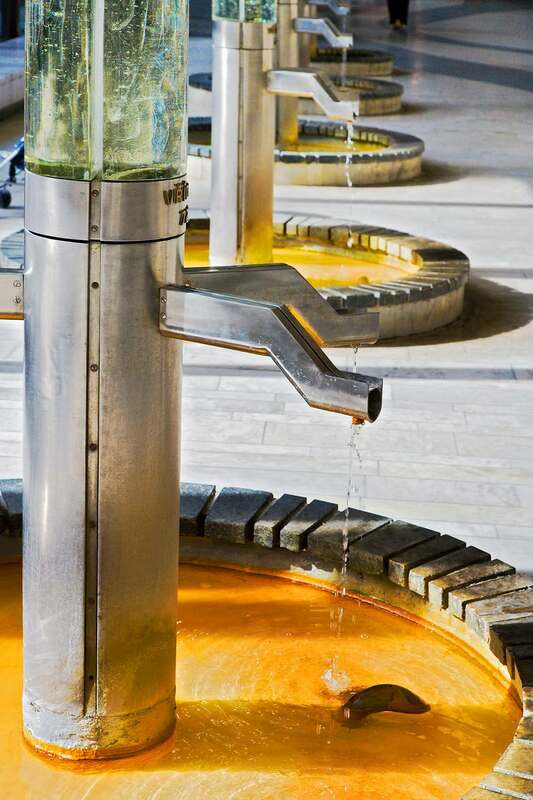 The water is partially diverted to several smaller fountains with lower temperatures, suitable for drinking. The colonnade is the work of Jaroslav Otruba (he is also known for designing stations of the Prague Metro) and was completed in 1975. The current construction replaced an earlier cast-iron structure designed by the aforementioned Ferdinand Fellner and Hermann Helmer. Perhaps the most beautiful of all arbours is the Freedom Spring Arbour (altán pramene Svoboda), located near Spa III (Lazně III) next to Mlýnské Nábřeží Street. Unlike many other of the town’s arbours, Freedom Spring Arbour is not a lookout, but it houses the seep of Freedom Spring (pramen Svoboda). Diana Observation Tower (Rozhledna Diana) is located very close to the town centre, at an elevation of 562 metres (1843 ft) above sea level. It is easily accessible by funicular from Grandhotel Pupp. If you would like to use your muscles instead, there are several hiking trails leading there. The Castle Tower (Zámecká věž) is located in the centre of the town, not far from the Market Colonnade. The tower is the last remnant of the castle that Charles IV built there in the 14th century. The castle burned down in the 17th century, but the tower survived. Visitors can climb the tower and enjoy a spectacular view of the downtown. Goethe’s Lookout (Rozhledna Goethova vyhlídka) is a beautiful Neo-Gothic tower located on top of a hill called Height of Eternal Life (Výšina věčného života). As some of the town’s collonades, this tower was also designed by Ferdinand Fellner and Hermann Helmer. 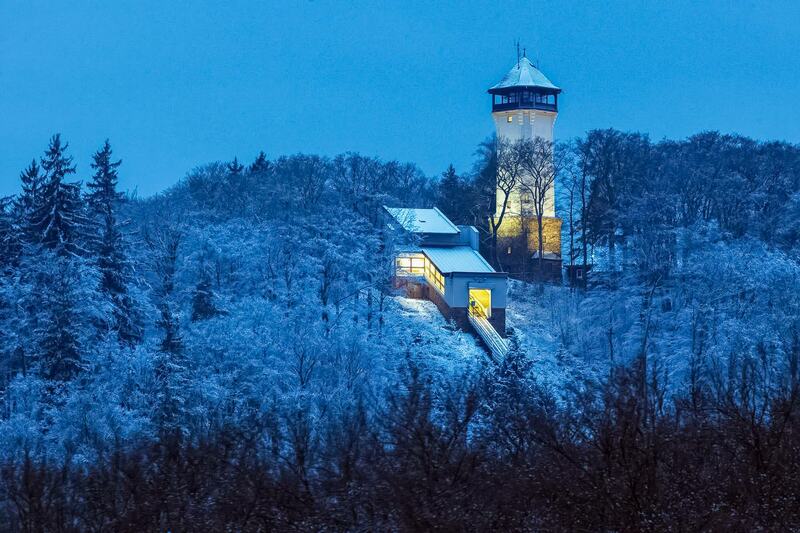 Unfortunately, at the time of writing, Goethe’s Lookout was not open to the public. Hopefully, this will change in the future. 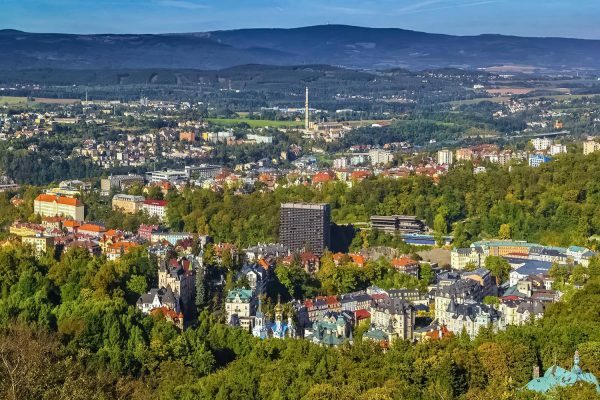 There is an international airport in Karlovy Vary (KLV), but the number of flights and destinations is very limited. At the time of writing, it serves regular flights to Moscow and seasonal flights to Tashkent. 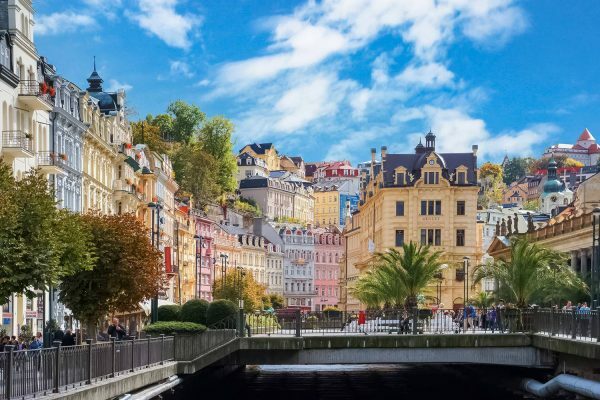 The lack of direct and convenient flight connections should not discourage you by any means, because the airport in Prague (PRG) is only 120 km (74.5 mi) away. There are some direct bus connections from that airport to Karlovy Vary. However, Prague Florenc Bus Station offers more connections, so it can be a more convenient option sometimes. Detailed timetables listing all options can be found here. At the time of writing, the fastest train-only option from Prague takes 3 h 13 min, because the train goes to several other towns (e.g. Most) before reaching Karlovy Vary. As a result of this, the route is 236 km (146 mi) long and the journey takes significantly longer than the bus connections. The route from Prague to Karlovy Vary via Most is reported to be quite picturesque, so it may be also a viable option for rail travel enthusiasts. The most convenient, comfortable and also fast alternative is booking private transportation. Obviously, it’s more expensive than public transportation, but it costs less than you would probably expect. Especially, if you travel in a group of several people, private transportation can be very attractive and the cost per person is not high at all. The Czech market leader in this field is Prague Airport Transfers. They can drive you from Prague Airport or from a hotel in Prague to Karlovy Vary or another place in Czechia or even Central Europe. You have choose between a sedan car or a minibus, depending on the number of people in your group. It is much better than a taxi, because their rates are much lower than regular taxis and you know the fare in advance, so you’ll never get overcharged. Here are their fares and conditions from Prague to Karlovy Vary. The Karlovy Vary International Film Festival (Mezinárodní filmový festival Karlovy Vary) is obviously the most popular event in the town. It is held every year in July. It has been organized continuously since 1946 and is widely considered the most important film event in Central Europe. Films from many countries compete in several categories and the main award for the best film is the Crystal Globe. Opening of the Spa Season (Zahájení lázeňské sezóny) takes place on one weekend at the end of April or at the beginning of May. The highlight of the event is a parade of people in historical costumes, featuring Charles IV, the founder of the town. It is accompanied by a crafts fair and concerts. Dvořák’s Karlovy Vary Autumn Festival (Dvořákův karlovarský podzim) belongs to the oldest music festivals in Europe. It is dedicated to the famous Czech composer Antonín Dvořák and has been held every autumn since 1959. The exact dates and details can be found on the website of the Karlovy Vary Symphony Orchestra.